Bluetooth, Rear View Camera, Steering Wheel Audio Control, Air Conditioning! The Honda Odyssey is a versatile and capable hauler combining clever and generous packaging with responsive handling and a smooth ride. 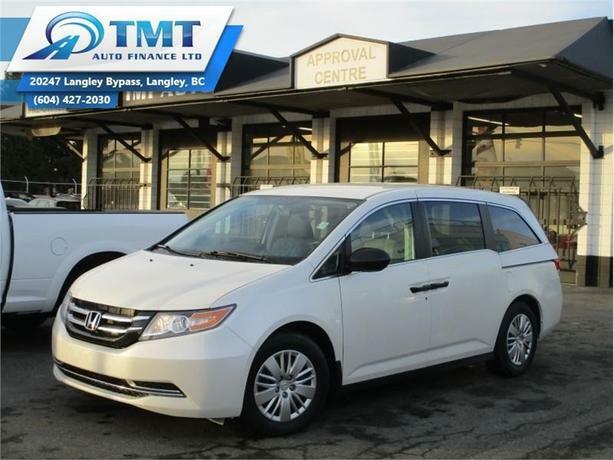 This 2014 Honda Odyssey is for sale today in Langley. There's a lot to love about the Honda Odyssey. The sleek, sophisticated exterior styling invites more than just glances, while the luxurious interior and premium technologies may inspire lounging. The engine provides power and responsiveness in good measure, so it may come as a surprise that the Odyssey achieves one of the best fuel economy ratings in its class. Unsurprising, though, is the fact that the Odyssey carries on Honda's tradition of exceptional safety features. Inspired by home but made for the road, it's the Honda Odyssey. This van has 99556 kms. It's white in colour and is major accident free based on the CARFAX Report. It has a 6 speed auto transmission and is powered by a 248HP 3.5L V6 Cylinder Engine. This vehicle has been upgraded with the following features: Bluetooth, Rear View Camera, Steering Wheel Audio Control, Air Conditioning. Our Odyssey's trim level is LX. The LX trim makes this Odyssey an excellent value. It comes with dual-zone air conditioning, a rearview camera, power front seats, Bluetooth mobile phone interface and streaming audio, an AM/FM CD/MP3 player with 7 speaker audio, steering wheel audio control, and more. Buy this vehicle now for the lowest bi-weekly payment of $152.76 with $0 down for 72 months @ 5.99% APR O.A.C. ( Plus applicable taxes - Plus applicable fees ). See dealer for details.